Eleanor has never quite fit in Society. She refuses to be a lady and insist on piloting an airship, to her aunt’s dismay. Her passion for flying isn’t the only thing setting her apart though. She has an hidden destiny, and it’ll be revealed in due time by mysterious – and handsome- Lord Greychester. A routine flight from Paris to England will change her life, for better or worst, and she will have to be strong if she wants to survive what’s to come. 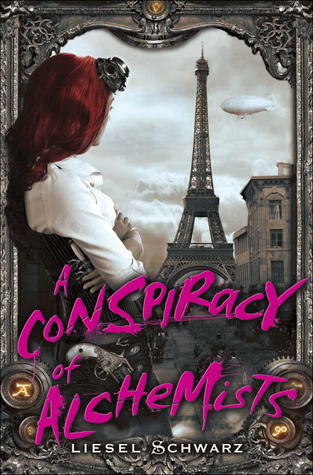 I truly liked A Conspiracy of Alchemists, but I would lie if I said I was hooked from the beginning. In fact, I almost stopped reading altogether. See, I love books set in the early 1900s and enjoy steampunk elements, but those very elements were so monopolizing that it impaired my enjoyment of the other elements. The machines were minutely described, as well as their functioning, especially at the beginning of the novel, and while it probably appeals to fan of the genre, it was just too much for me. Thankfully, as the story progressed, the plot and characters were foregrounded, though the spark technology was still present. I really started to enjoy myself at about 25% of the book, and I’m glad I did because I was ready to give up and it would’ve been my loss! Liesel Schwarz created a very unique open world for her readers. Paranormal creatures the likes of werewolves, fairies, alchemists, vampires and warlocks are out of the closest and the plot is centered around the last three, fighting for control over what little magic there is left in the world. All those paranormal creatures are said to be of Shadow and as Light (science) gains power, Shadow looses ground. As interesting as the concept is, it took me a lot of time to figure it out and I wish Liesel laid down the rules earlier in the novel. Even though both Vampires/Alchemist and Warlock are all Shadow, the former are mostly bad guys and the later the good guys. I particularly like the symbol system warlock used to find one another. It was a great idea! Lord Greychester a.k.a Mr. Marsh was my favourite character hands down. He is fabulous, but more precisely he is a man of honour even though he has to deceive Elle for what he thinks is the greater good. He also has this graceful way of speech, with an easy smile and a great sense of humour. There is a great magnetism around him and if I were a fictional character, I know I’d be all over him lol Elle was an highly likeable character. I appreciated her guts and her determination. Being a little less pig-headed would make things so much easier for her but I liked that she was genuine. We were also blessed with a great range of secondary characters and while I liked some, there are some I trusted only as far as I could throw ‘em, which made for a great mix. Elle will be deceived by more than one man, and I have to confess I didn’t see the betrayals coming. With a slow build-up, the plot didn’t hook me from the beginning, but by the middle of the book I could barely peel my eyes off my kindle. The end is worthy of a big Hollywood production, I could totally picture the huge explosions with flames and smoke. The epilogue totally stunned me and I’m really curious about all the behind the scene stuff miss Schwarz hid from us. I don’t think I’ll buy a copy for keep, but I truly enjoyed this novel and strongly suggest it to Steampunk fans. I’m convinced A Conspiracy of Alchemists will rock your world! Schwarz obviously did a lot of research while writing her book and I think it paid off. Well, that is so nice to know that you enjoyed this. I have this one, but haven't gotten around to reading it yet. When I do, I'll have to remember to just keep going through the beginning, that it will get better.